Well currently between jobs and with no transport I was contemplating how I was going to bag the Affric Munro’s this year before the cold weather comes in from the north. With a great week on Skye last week with Andrew, Victoria and friends I had seen an opportunity. Before going to Skye I had packed a spare rucksack with camping gear and all the essentials required to traverse the Affric Mountains from Knitail to Cannich and Danny would drop me off in Kintail early on the Saturday morning. Ah, “The best laid schemes o’ mice an’ men Gang aft a-gley” a statement that was to prove only too true as we drove into Kintail to a downpour. After a heavy week on Skye I was not happy to head of into the hills under such conditions with a big walk involving overnight high camping planned and so the walk was put on hold for the time being. So Saturday came and went and on Sunday I was surprised to see a good weather forecast for Tuesday and Wednesday. Quite coincidentally Citylink posted a travel offer in Last weeks Sunday Mail for return Citylink travel to anywhere in Scotland for £5 for the whole of October. Yabadabadoo. That means I can travel to Inverness and back from Dunfermline for £5. So a new plan was hatched to do the walk from Cannich over all 8 munros and back to Cannich. This would be around 75kms and was going to be tough so I repacked my gear and added another evening meal realizing that I may be camping out over three nights. 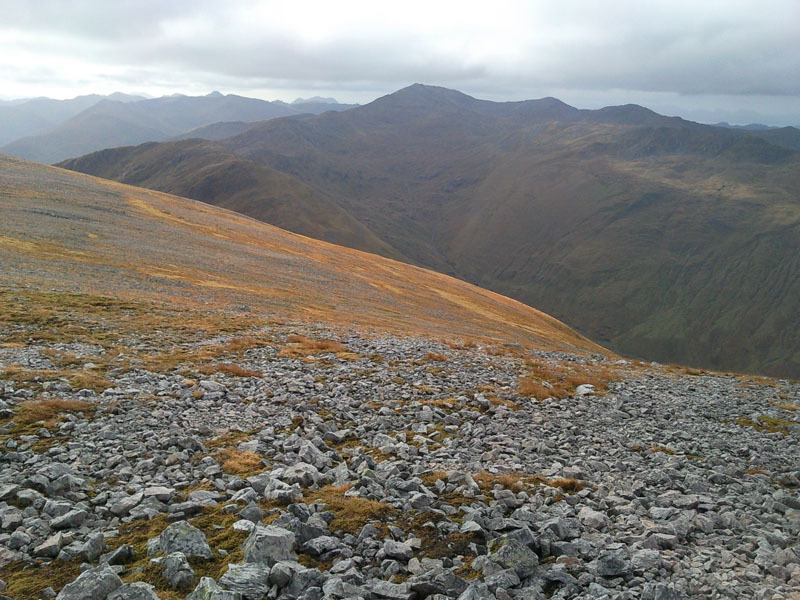 As luck would have it Andrew was spending three days up North Munro Bagging and was intending to bag the Kintail two, A’Ghlas-bheinn and beinn Fhada on the Wednesday and would be happy to pick me up in Kintail. That would work out brilliantly and would save me 15km’s walking so the Cannich to Kintail route was back on. When I was repacking my kit for this walk on the Friday in Skye, Danny weighed it with his fishing scales and it came in over 40lb. Well on reflection I carried this kind of weight when I done the Northern Mullardock four two years ago and it nearly killed me so we set about trying to lose some weight. The bag contained the following: An argos tent, a tesco sleeping bag, a waterproof blanket, a complete change of clothes for the journey home, Food for two days, emergency kit comprising off, torch, headtorch, puri tabs, blister patches, first aid kit, lighter, spare laces, ball of string, survival bag, spare phone batteries, toilet roll and other bits and pieces, two spare walking tops, two pair of socks, waterproof jacket and trousers and 1 litre of water. Well we could only remove about 5lbs which meant removing my jeans (which are surprisingly heavy), replacing with a pair of lightweight trousers and removing a couple of other bits and pieces. Well after replanning this walk for midweek, I put my jeans back in and added another days food and some of the bits and pieces removed above. On reflection carrying over 40lbs on your back for a big walk was not one of my brightest ideas hahaha. So Monday at 0947 I was on the citylink coach to Inverness arriving at 1335. It was then a short wait for the 1400 bus to Cannich arriving just before 1500. The weather had been a bit overcast on the journey up with a little rain but as we drove into Cannich the drizzle came on again. It wasn’t heavy just slightly off putting. I decided to head into the Slaters Arms for a coffee only to find it was shut. The drizzle was very light and almost stopping so at about 1515 I was walking into Glen Affric. I took lots of photos but I think my memory card on the phone was full and as I took another photo it seems to have deleted the oldest photo. This is annoying because the first photo on record is the summit of Tom a’Choinich. The road in is all tarmac and very flat. The walk takes me past the Glen Affric signs and past the power station and onto the dam at the end of Loch Beinn a Mheadhoin. Its a little bit cold and the pack is feeling heavy. I get to the dam after 8km and have to change my socks because they are rubbing. This is probably a joint result of the constant tarmac and the weight on my back. Its now about 1700 and I still have 8km to go before I find a camping spot near the car park by the small bridge for the night. Shortly after leaving the dam a car pulls over and a chap (Colin coincidentally) asks if I want a lift. I was not thumbing for a lift but it would be rude to decline so Colin gives me a lift for the remaining 7km to the car park. Colin is planning the world orienteering championships to take place in three years time and is meeting landowners to discuss the logistics of the event. There is another car park at the end of the road but the car park for Toll Creagach is easily identifiable by the small bridge crossing the burn and the small headland jutting out into the Loch. Its only a small parking area and there is a landrover parked with what looked like stalkers getting ready to leave the glen. I depart from Colins car (thank you very much) and head off up the track past the forest. Now I was ahead of schedule so instead of looking for a spot to set up camp I decided to walk in and get the majority of the climb up to Toll Creagach out of the way. The path slowly climbs as it heads North and then East. After approximately 3km there is a junction in the path whereupon you could take the North East branch approaching Toll Creagach from the South East but I had read that this was very boggy so I continue West along the path for another 1km to the Waterfalls. Toll Creagach is Now 2km directly North and I strike out up the steep hillside. This is hard work and as I ascend I am contemplating camping when I find a suitable spot. Would it be wise to continue all the way to the summit with darkness closing in or camp on the slight top around the 800m contour. Well my legs decided for me and after finding a reasonable spot just as the grass was stopping and more rocky terrain was starting I set up my camp. I had taken a spare water bottle and filled it from one of the small burns on the ascent. I was now snuggly in my sleeping bag and set out to eat as much as I could to reduce the weight I have to carry hahaha. Its going to be a long night. 12 hours of darkness to be precise. Just as well I have taken two books along with me. Its getting cold. The tent which was great last time I used it (not quite sure when that was but it was definitely much warmer outside), was like a wind tunnel. The cold wind was blowing in under the flysheet and through the mesh, which was woven nice and tightly enough to keep the midges out but no good at keeping freezing wind out hahaha. I was reasonably warm in the bag but as soon as I opened the bag to go fo a call of nature I realised just how cold it was. In addition I had not brought a sleeping mat and the ground was very cold below the ground sheet making for a very uncomfortable night. After resuming my position it took a shivery 30 minutes or so to warm up again and I vowed to stay in the bag until daybreak. Well daybreak came with a covering of frost on the tent and covering the ground. There was only a slight wind but the air was cold. After a quick bite to eat and some fluids I was packed up and on my way to the summit arriving on the summit of Toll Creagach at around 0830. The sun was trying to come through and the views were excellent. No time to stop though and I head East for the 3km to Tom a’Choinich. I found the ascent from Beallach Toll Easa to the summit to be one of the toughest ascents of the day but maybe I was moving to quickly with the weight on my back and I soon settled into the slow uphill slog commensurate with my attire. 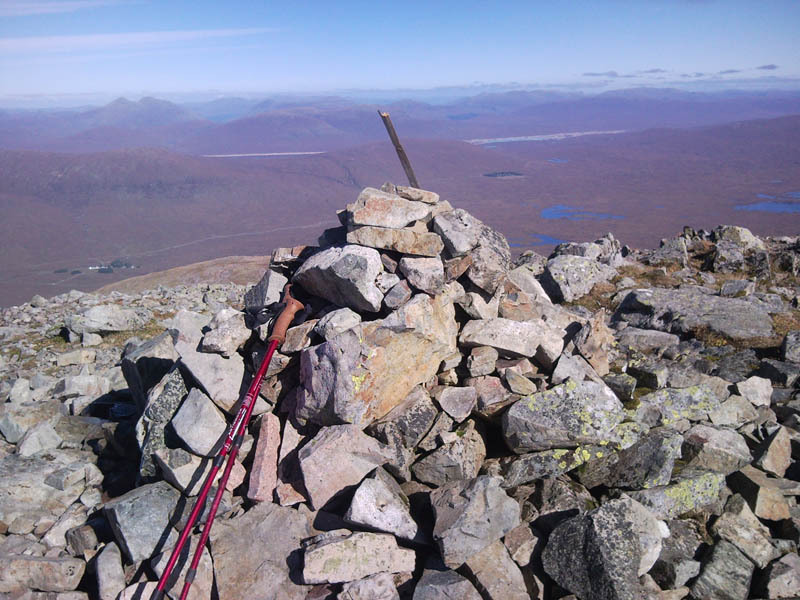 Its now approximately 4.5km to the summit of Carn Eige crossing some nice craggy terrain with spectacular views all around with the beautiful Choire Dhomhain to my right. I have a good stop at Carn Eige and eat and consume the rest of my water. Its now a hop skip and a jump to Beinn Fhionnlaidh leaving my pack just above Bealach Beag. What a relief to drop the pack. The views are superb even though a cloudy haze is shrouding the sun. The view from the dam along the Northern ridge and over to Southern ridge is very impressive. I have a little jog back down to my pack but I am careful not to go at any particular pace and in fact the slight jog gives my muscles a break from the constant prolonged tension of the leg muscles walking up and down the craggy terrain. I retrieve my pack and take the bypass path below Carn Eige heading South for mam Sodhall. At some point I lose the path and descend further than I was expecting but the bonus being I found a raging burn in which to have a wash a refill my three water bottles. I plod all the way up the easy ascent to Mam Sodhall and arrive just before 1400. Another good rest with some shut eye and I am again moving, this time South West for 3.5km to the summit of An Socach. 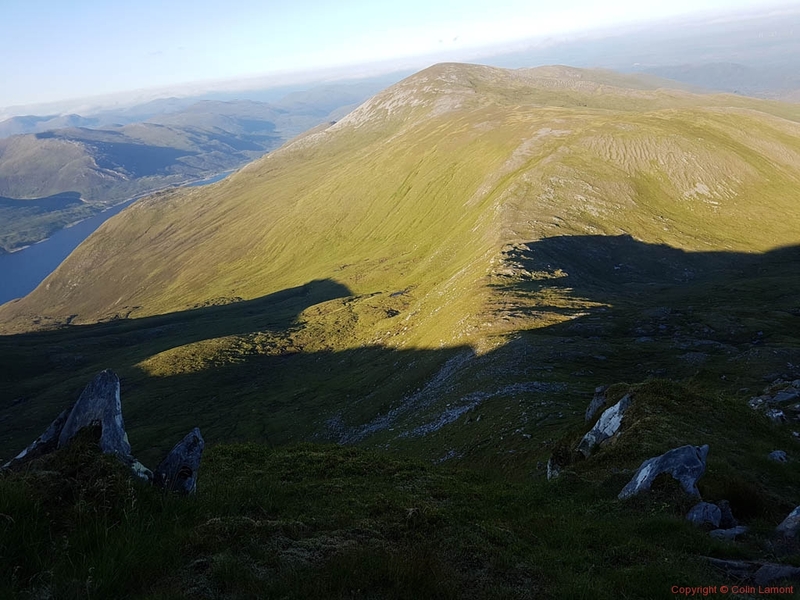 Mam Sodhall is at a height of 1188m and after a short descent of 100m or so over 1.8km there is a steep descent of 300m down to the Bealach Coire Ghaidhei at 750m then an easy enough ascent up to the spot height and onto An Socach summit. Its now an undulating ridge up over Stob na Cloiche and onto and over the 941 spot height where I come to a rest at the bealach. Its now 5pm. 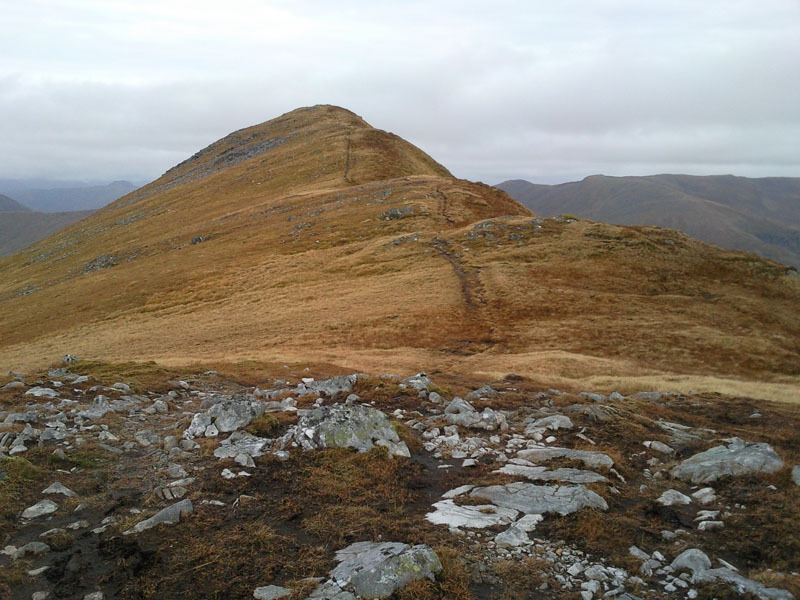 Sgurr nanCeathreamhnan is staring down at me from a height of 300m and 1.5km. On planning the walk I had intended to cross the Coire nan Dearcag at this point and then drop the pack for the 6km return trip to Mullach na Dheiragain with the final 350m ascent up to Sgurr nan Ceathreamhnan. 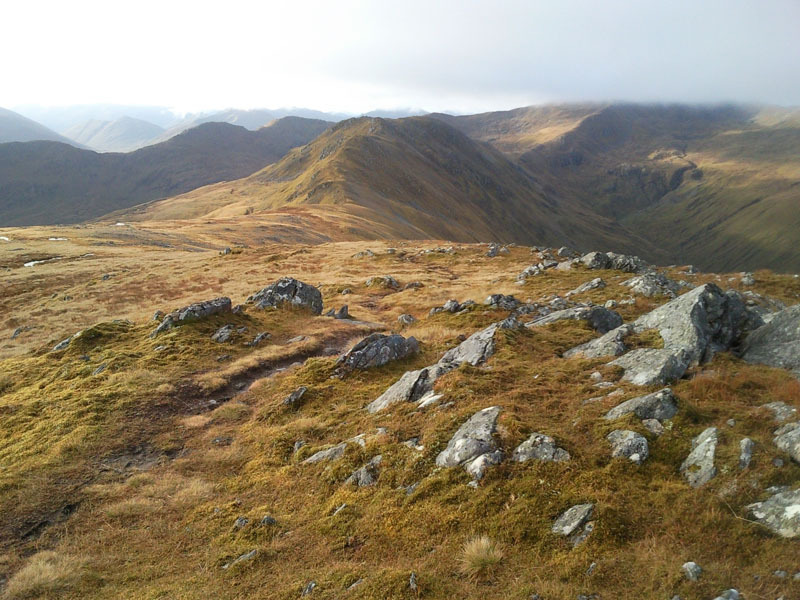 I was now thinking that I could do this today, but with darkness coming in just after 1900 I would not be able to bag the last Munro before dark and then trying to find a camp spot in the dark maybe would not be such a good idea. So a decision was made to make camp where I was and have a very early night. The night was cold but certainly warmer than the night before and I arose at a leisurely 0800. After breakfast and breaking camp I was on my way dropping into the corrie, across the hags and up to the Beallach on the other side. The corrie is easy to cross and there are plenty burns for replenishing water. Be aware of course that we have had a wet time of it lately. I am sure this corrie was pretty dry when Andrew and Tim done the Mullardock round in May. I again drop the pack just taking a few essentials with me. There was no frost on the ground this morning but there was a cold wind blowing. Its now approximately 6km out to Mullach na Dheiragain and back over the craggy Carn Con Dhu and only takes me 1.5hrs. There was a wall of cloud at around 1100m all morning and it had engulfed the summit of Sgurr nan Ceathreamhnan but after replenishments at my pack the cloud was lifting. It was not long before I had scrambled up the ridge to the summit of Sgurr nan Ceathreamhnan and with the cloud now high above me the views all around were stunning. I met a chap here, the first walker I had seen since I had set out from Cannich. He had come up from the end car park to do some summits and tops. After a quick discussion I was again on my way, down and up over the scrambly ridge to the second top of Sgurr nan Ceathreamhnan. 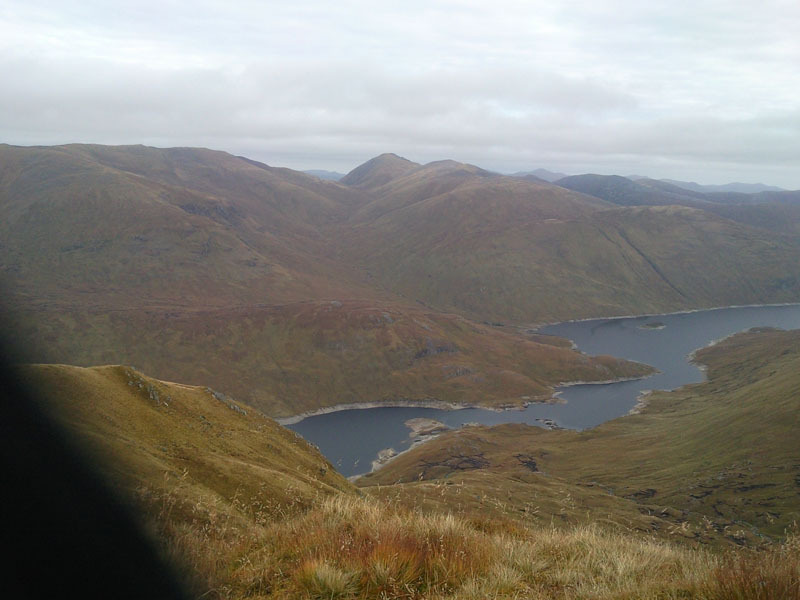 My plan now was to head directly South West for 3km and join the good path at Loch a Bhealaich which would take me over Bealach an Sgairne below A Ghlas Bheinn and down into Morvich and kintail. The terrain is lovely grass all the way down but in truth its better and less steep to follow the fence posts down from the SSW then continue following them as they head South West to the bealach below the Corbett Sgurr Gaorsaic. After another grassy descent of 300m I am on the path past the loch and over bealach Sgairne. I am now on the path to Kintail. I did wonder if I would meet Andrew here but he opted to walk Mullach Fraoch-choire instead. About 1km from morvich I received a message from Andrew and he asked if I wanted a lift. Again it would have been extremely rude to refuse and he gave me a lift the last 2km to Kintail Lodge hotel. That’s was a different walk to all of my previous walks for many reasons. 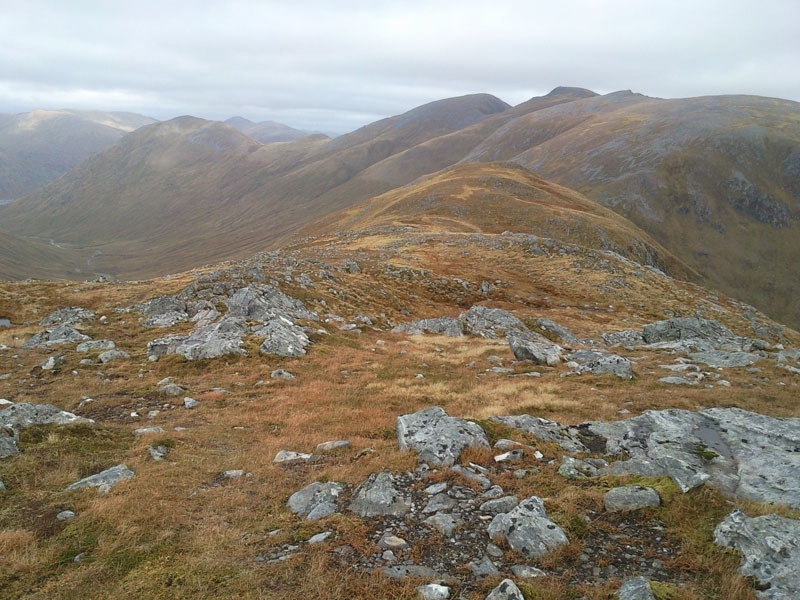 Another 8 Munros in another stunning piece of Scotland.